Will your Postage Meter be obsolete on January 1, 2009? As late as the mid ‘90s, most mass-mail and corporate mailrooms still used manual setting postage meters – inefficient, bulky machines that had to be serviced by US Postal Service employees or the meter company every so often, when the meter ran out. Along with being inefficient, they were also relatively easy to tamper with and presented a security compromise for the U.S. Postal Service from both a tracking and monetary standpoint. Since then, the USPS has issued three mandates meant to nudge meter users toward online printing for metered mail. While much of the “meter migration” plan targets efficiency of the meters, the US Postal Service has also been concerned about security. Just as the Treasury Department has redesigned US currency every few years to keep ahead of counterfeiters, so has the USPS issued new security and anti-theft mandates to meter manufacturers. To that end, the USPS has gradually rescinded certification (official permission to use or maintain) for a variety of meters that are no longer up to USPS standards for security. By New Year’s Day, 2009, a broad range of meters will no longer be legal for postal use. Which meters are affected, and what does this mean if you are currently using one of these designated meters? First, for all monies remaining on these meters during the first ninety (90) days of 2009, the USPS has the option of refunding any or all of the balances remaining on these meters. Consequently, the remaining funds could be unrecoverable. Second, these meters will no longer be supported technically, should any problems or breakages occur. Finally, possible service disruption of your mailing operation due to prolong delays and downtime while waiting on a traditional meter replacement, due to overall inventory levels. Print postage from your PC and save at least 50% over the cost of a postage meter. The good news is that as a customer of Stamps.com, you don’t have to worry about the migration. With our online postage service, Stamps.com customers aren’t tied to a postage meter that may become obsolete due to USPS mandates. 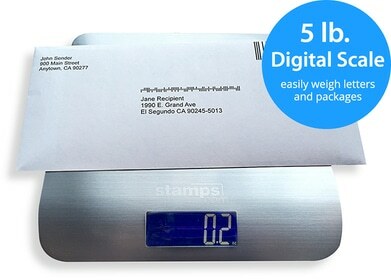 Your own printer, coupled with the digital postage scale provided by Stamps.com, is all the postal meter you need. Any required changes are made behind the scenes, so to speak, with no intervention necessary on your part. By switching to Stamps.com, you also avoid paying for the expensive proprietary inks and other added fees associated with using a postage meter and often charged by meter companies. And remember, as a Stamps.com customer, your overall monthly rate for using our services is considerably less than using a traditional postage meter.